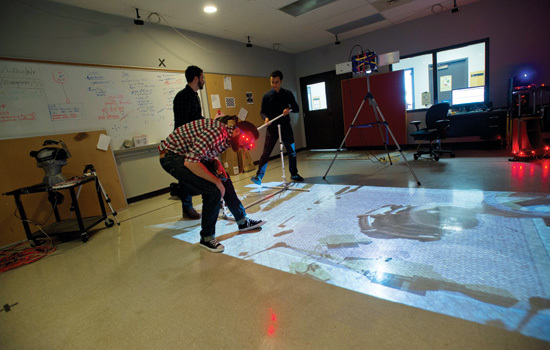 Student researchers in the Perception for Movement Laboratory in RIT’s Chester F. Carlson Center for Imaging Science combine eye tracking, virtual reality and motion capture to investigate how people use vision to navigate the natural environment. Kamran Binaee, right, an imaging science Ph.D. student, designs computational experiments with vision scientist and lab director Gabriel Diaz. They explore where people put their eyes when performing simple tasks, such as hitting a ball or walking. Parameters created within a virtual-reality environment free Binaee and Diaz to focus on how vision guides action when, for instance, Andrew Smith, fourth-year imaging science student, strolls through a projected scene on the lab floor. As a student-centered research university, RIT combines the mission-critical activities of research, scholarship, artistic creation, creative inquiry, teaching, and learning across all degree levels and disciplines. By conducting government-funded, interdisciplinary, high-impact research and by partnering with business and industry in private research and development, we will advance the boundaries of knowledge and the application of new technologies. Recognizing that participation on research teams enhances critical and creative thinking, collaboration, and cross-disciplinary competencies, we will facilitate the participation of undergraduate and master’s degree students on funded research teams. We will enrich the graduate student experience through a holistic approach to their success, and we will develop opportunities for all students to collaborate across international and intercultural borders. RIT will be internationally distinguished as a research university through its focus on and investment in specific inter- and trans-disciplinary research areas identified through a systematic and inclusive selection process. RIT will maximize the impact and financial support gained through its research programs by collaborating more extensively with business and industry to yield $100 million in total research funding annually. RIT’s research enterprise will be a national model of leveraged diversity (disciplinary, generational, global, and experiential) based upon the principle that teams constituted of members with diverse expertise, talent, experience, and backgrounds drive the best questions, the best processes, and the best solutions. RIT will enlarge its graduate portfolio through adding professional and research-focused programs in STEM fields, the humanities, social sciences, and arts, bringing the graduate population to 30 percent of the total student population. New programs will include experiential learning, research, scholarship, and co-curricular opportunities. All programs will strive for the highest levels of excellence and global recognition. Continue adding interdisciplinary Ph.D. programs that are in line with the university’s research strategy. Create an external research advisory board comprised of impartial, recognized experts to guide the selection and evaluation of strategic research areas. Create a special program to encourage collaboration in research activities with alumni-led businesses. Increase the number of master’s and bachelor’s level students on funded research teams.